"The last man on Earth sat alone in a room. There was a knock on the door..."
The brightly-colored oil paintings on the covers, the slogans promising strange and bizarre adventures: pulp fiction is one of the staples of American fiction, a major source of entertainment in the middle of the 20th century. 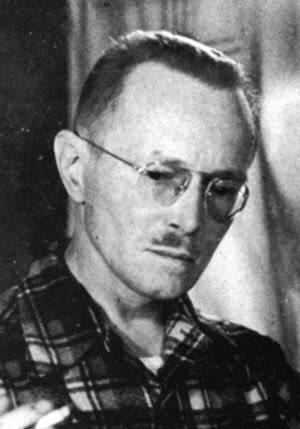 Fredric Brown was a very prolific practitioner of the science fiction branch of the genre, churning out nearly twenty-five pulp novels in his career, in addition to his numerous short stories. Fredric Brown's work was full of paradoxes and word play, often exploring odd psychological traits, and usually involving amazing and numerous plot twists. He was the master of the interesting conceit. Perhaps this is why, according to legend, he was said to be an inveterate procrastinator who was described by his wife as hating to write. The work of generating shocking and inventive plots is hard work indeed. Further, Brown was interested in pushing the limits of the form. "There are no rules," he once asserted, "you can write a story, if you wish, with no conflict, no suspense, no beginning, middle or end." Yet his most noted short story, "Knock," had all of those things. Try this beginning on for size: "The last man on Earth sat alone in a room. There was a knock on the door." The story is set in a post-apocalypse, after aliens called Zan have exterminated most of the human race. It was adapted by X Minus One and Dimension X. "Crack Up" is about a man with a memory disorder. It opens with him--George Steele--waking up in jail talking about a train wreck that never really happened. In its iteration as an RKO movie, it was billed as "the startling story of a mind that lost itself...of a man who couldn't forget a kiss...couldn't remember a KILLING!" It was adapted by Lux Radio Theater in 1946. 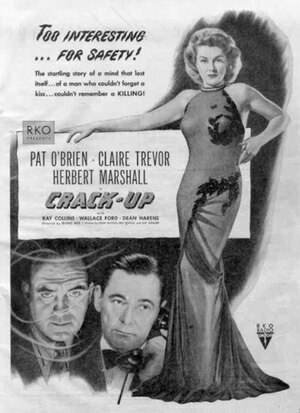 It starred Pat O'Brien and Lynn Bari. If you're interested in having your mind boggled, the Fredric Brown collection is for you. Be the first to comment on "Fredric Brown"